Image : 60.0 X 81.3 Cm. Paper : 65.0 X 90.0 Cm. Frame : 87.5 X 110.0 Cm. 5 K's Article of faith. 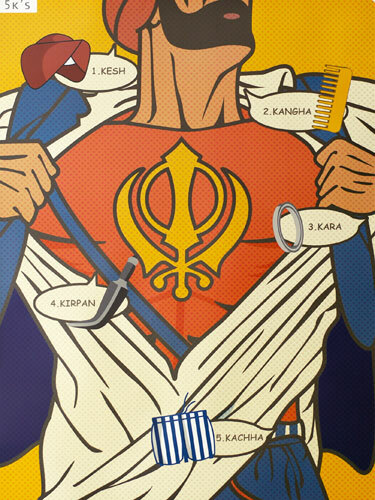 Sikhism defines Kesh, Kanga, Kara, Kirpan and Kachha as the 5 articles of faith. Oh young Harry Singh has come back from the West, His Kesh, Kirpan, Kaccha were put to the test. His Kangha and Kara he proudly displayed. To dansels he wooed, while their fathers dismayed. He floats like the butterfly, like the bee he can sting. There never was a Sikh like young Harry Singh.